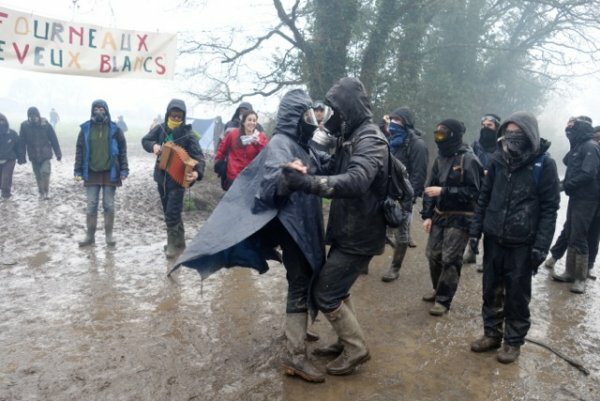 Home / Eco / Live Blog: The Eviction of #ZAD #NDDL Day 3: #ZADResist! Live Blog: The Eviction of #ZAD #NDDL Day 3: #ZADResist! We are a bit late again, but now we will continue with the 3rd part (on day 3 of the eviciton) of our Live Blog of the ZAD evicion. If you want to contribute to our live blog; You can send your pictures, videos, reports and analysis. Go to our submit page: here. Click at the refresh button of your browser to get the latest information. 10:02pm We will end our live coverage of the ZAD eviction for today but tomorrow is day 4 of the eviction and we will be back with another live blog. Thank you for reading! 09:31pm Denounces a subcontractor! The telephone number of the company that participated today in the repression operation by loading the cars of the inhabitants, supporters, and all the people who came to support us is 0240291515, Louis XVI 114 Rue de l ‘ Etier in Nantes. This is the same company that had participated in the crackdown on the escargot operation. We count on you! 09:16pm Back on the violent evacuation of the person who was on the roof of the Chèvrerie to prevent its destruction: by holding on to the sheets of the roof, two tendons cut on the same finger, 30 stitches on the palm of one of his hands , and 15 stitches on the other side of the same hand, the other hand damaged, while handcuffed and forcibly evacuated. 08:09pm Situation is “calm” again in Lascar, at Saulce crossing, we count our injured people! They secure machines that have arrived (a mini excavator and a backhoe-loader) to Isolette from La Pruche. Trucks evacuate all that can be used as barricades along the route of Fosses and Saulce. 07:46pm Need help ! Despite the statements of the prefect, GM troops are increasingly numerous at the Saulces crossing, and the violence continues. They continued throwing tear gas, and offensive Cougar grenade launcher in just about any direction! An injured man was evacuated to the Lascar barricade. The Isolette has been evicted, but it is not known yet if it was destroyed. 07:29pm (Google translation) Median balance sheet, not exhaustive and undervalued! Today at 17:45 (05:45pm), we saw 9 injuries because of the use of Flashballs, including a serious face injury, 16 injuries following shots of tear gas grenades to the head. According to the medics, it is obvious that they use tear gas grenades as a projectile to target people. There are also 22 blast injuries from grenades, including 15 grenades, including throats, and suspected tendon and nerve sequelae, and others with related hearing impairments. to the F4 pomegranate explosions fired blind on the gent.te.s. With 12 more head injuries, some affecting the eye. There was the evacuation of a person seriously injured in the car by helpers who was blocked for more than 30 minutes, before having access to the UAS, without the caregivers being authorized. to come back. There are three journalists injured after being deliberately targeted. 07:28pm Big convoy of cops coming from Vigneux (video). 07:21pm The joke of the day I! The prefect reportedly announced that the expulsion operation was over for today and that the cops are currently intervening (with offensive grenade, tear gas, grenades, armored vehicles, 2500 PSIG soldiers …) only to maintain order and regain control of the roads. 07:17pm Medical point: Faced with the violence of the conflicts and the difficulty of being able to reach all the places, a HQ med was opened with the Transfu, behind Rolandière. Need bicarbonate Soda on site, calls for donations, help, help! 07:10pm Call for tractors to join the Lascar barricade at the Saulces crossing, in the direction suez! Armored vehicles with forward blades were seen on the D81 towards La Saulce, accompanied by some 30 cop trucks. And the second cabin of the 4L was destroyed! 07:02pm The medical team is not big enough to take care of all theinjured people, and some parts of the zad are still not accessible to the medical teams, especially because of the cops prevent people from passing, including journalists to avoid photos and testimonials. 06:46pm The 4L is down, another shack was destroyed by shovels, the confrontations are very violent and continue at the Saulces crossing, journalists are shocked by the violence observed! The Grée is still surrounded by countless cops! 06:29pm The cops entered the west of Zad, Suez road and crossroads of Saulces, at the Lascar barricade. Important confrontations: armored vehicles, F4 grenades, tear gas, … Activists are on the roof of the Ambazada for one hour now. Farmers arriving @ZAD #NDDL for past 2 days in over 50 tractors, one convoy arrived yesterday and one today to great cheers, tractors positioned around farmhouses that are now in danger. MERCI!! 06:10pm In Rennes people are protesting in solidarity with ZAD and distributing flyer for a big demonstration in Nantes on Saturday and the re-occupation of ZAD on Sunday! 05:35pm Gourbi that was built collectively during the festive projects launched at the time of the bidada referendum about the airport, has just been demolished. 05:25pm According to French mainstream media outlet 20 Minutes Nantes the police opertaion at ZAD will stop in about 1 hour. The cops will come back at 06:00am tomorrow morning. 05:23pm On the side of Grée, good news, they just bogged down a truck and there are noit a lot of them (about twenty cops). 05:22pm Between six and ten diggers from Vigneux and towards saulces have just been reported. 04:41pm War at La Gree. People are surrounded. URGENT: The need support! 04:27pm Electricity has been cut off all the way from Suez and fosses noires road. The cops are advancing today but people keep resiting and again and again cops also have to retreat (video). #ZAD NEEDING MORE PEOPLE & SUPPORT!!! 03:37pm A very large device of the cops was deployed on foot at saulces crossing and near forêt de rohanne (forest). The cops unfurl around saulce and enter the orchard south of the moulin (mill). 03:35pm And it goes on … The cops invaded the Grée. People are on the roof. 03:16pm Another journalist (reportes of @Reporterre)injured. She was hit on her leg by a grenade from the cops. She will be brought to medics point. At 06:00pm (18:00) today, Wednesday April 11, there will be a gathering in solidarity with ZAD in Freiburg, Germany. People will meet at Theater Freiburg. You will find the Call (German): here. Livestream: Cops attacking the picknich protest at ZAD. Go, to give back joy in our hearts, a small tour of the solidarity actions of solidarity towards the ZAD everywhere, to find here. Every day new actions: today city hall in Die is occupied !! and Monday, No tav activists blocked the customs at Montgenevre. You can not imagine how much it boosts us, your actions, your messages. So just a word to everyone: thank you !! 02:37pm Copains anounce that 20 additional tractors from Vendée, Côtes d’Armor and Maine-et-Loire will come to ZAD. 02:17pm Arrghhh … The cabin of Gaité fell, as well as the la Boite Noire and Dalle à Caca. They destroy ? We will rebuild. If you want to take a look at the pretty ZAD huts before destruction, it’s here. Many still are standing, we will save what we can together. Resistance! 01:25pm Bellich still stands, and the anti-riot fence was removed from the road between NDDL and the boissière. #ZAD #NDDL is under siege, cops block roads. 01:01pm According to French mainstream media reports the cops stated that they will not evict the occupied Tolbiac (Paris) university today (Wednesday April 11). 12:39pm 8 so-called “tracteurs vigilants” arrive at Fosses Noires. People are applauding. 12:25pm People preparing the defence of ZAD (video). 12:13pm BELLISH: The destruction of the place seems imminent. We call to go on the spot to do what it is possible to prevent it! Another place with an agricultural project threatened with destruction, to believe that the gendarmes do not read what the prefect wrote about the agricultural vocation of the area! There is a way to pass by Paquelais and / or across fields. 10:52am They seem to be organizing the cops on the side of the D81 to disperse in the fields and try to stop people from reaching fosses noire across the fields. Let’s be creative, they are too small minded to succeed in blocking us. 10:35am The cops have returned to Mancelière Richard. We want more details on the presence in La paquelais and vigneux-de-bretagne. It seems to be possible to cross the field since people are still joining us this morning! Thank you to all. 10:32am 2 people have just evacuated by the medics.It explodes a lot in the field of angry Lama. And after the prefect will continue to say that they do not want hurt. class=”notranslate”>Clear!>Everything will be fine. DEMAIN S’ENTÊTE sur la ZAD de Notre Dame des Landes, a video made by ZAD residents. 10:04am Traffic information: The cops are no longer in mancelière Richard, it is again possible (for the moment) to go through there. 09:55am Confrontation, picnic and workshops: The confrontation continues to Lama faché, we hear a lot of grenades. People take turns in different places to follow the movements of the bleusaille. It is also organized elsewhere in the area to better accommodate people who want to join us. A group home is formed. And workshops to allow everyone to find actions that correspond to them are put in place. At the moment it’s manual activity: come learn how to make painting eggs (at camp level of white hair). We take this opportunity to remind you that a picnic will be held this afternoon at the cheveux camping, in the field in front of the Fosses Noirs at 13h. We will certainly advise on the moment depending on the position of the gas cloud that unfolds for a few days on the hedgerow. Welcome to all. 09:45am “If I can not dance it’s not my revolution” Emma Goldman (if I can not dance, it’s not my revolution). Here we dance, despite the clouds of lachrymos. No circulation between ardilleres and Oak of the perriers + prohibition to circulate between _ Oak of the Pointers and pink house. Gendarmerie vehicles present at the paquelais. A priori, the mancelière richard passes tjs (between paquelais and vigneux). So, you can always put your cars in front of our barricades and continue on foot! Be careful, they are potentially searching for bags and vehicles. Think of the max to ask the papers that authorizes them to do that, and if possible to take pictures and send them to us! 08:26am Cops positioned in the field north of lama, but not in the lama field because people remove debris from the cabin. Several explosions of grenades, but it’s pretty quiet. Barrier riot deployed at Boissière, north of the crossroad direction NDDL. 07:14am All axes are not yet blocked if you want to join the area, need world around the lama or the cops are offensive, just like their grenades. 07:04am and the detonations continue. in Le Monde, we learn that 4 cops were self-injured by the sending of an offensive grenade, including a serious injury to the foot. In addition, they do not even know how to shoot. It should be remembered that these grenades, which contain 30 g of TNT, are extremely dangerous. In our country, “two seriously injured people had to be evacuated to hospital, and four people were treated for serious injuries. they surround the area, they are numerous, we are determined.